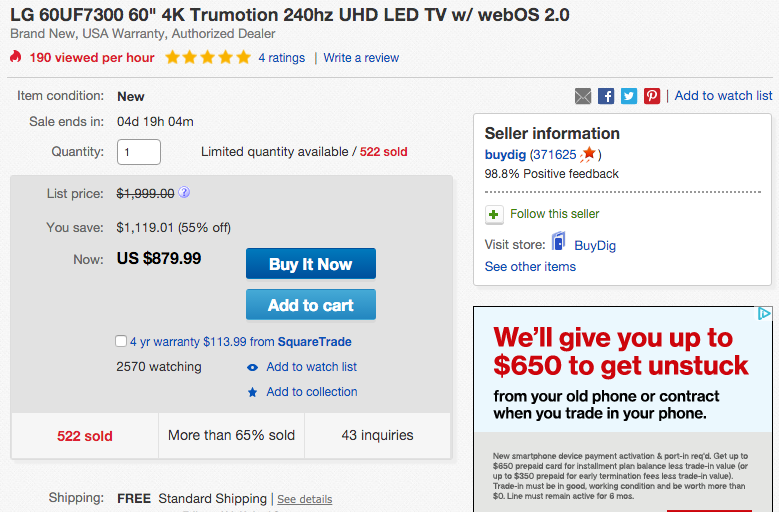 BuyDig via eBay Daily Deals offers the LG (60UF7300) 60-inch 4K 240 TruMotion Smart UHDTV w/ webOS 2.0 for $879.99 shipped. That’s good for $320 off the regular going rate, $19 less than our previous mention and the lowest current price available from a trusted retailer. The LG 60UF7300 features a 4K display with 240 TruMotion (120Hz effective) refresh rate, and three HDMI inputs. It also features smart functionality with LG’s easy to use webOS 2.0 operating system. Rated 4.5 out of 5 stars from 842 Best Buy reviewers. One of the secrets behind LG TVs’ outstanding 4K UHD performance is the specially designed display panel. IPS 4K delivers true colors that remain more consistent at wide viewing angles, with four times the resolution of Full HD. With IPS 4K, any seat can be the best in the house. LG Smart TV with webOS 2.0 has been redesigned to be simpler and more fun to use. Just sit back, relax, and let webOS 2.0 help you find exactly what you want to watch.